As most of you probably know myself and Phil Brooks are captain and vice captain this season. Ade Summons and Dave Maunder are are taking charge of the second team. We have 2 3-hour net sessions at The Beaconsfield School, Wattleton Road, Beaconsfield, HP9 1SJ. These sessions are open to all members, including league and social players plus the youth team players. There are 3 nets available at each session plus I will bring my bowling machine along. Nets will be organised and productive for the upcoming season. The dates are below, plus we will round things off with a trip to the pub after the nets for those who are interested. Outside nets will commence on Tuesday April 8th, 6pm til 8pm. The final net will be Tuesday 2nd September. Nets will include the bowling machine, batting, bowling, fielding and fitness. Saturday league teams will be selected after nets on a Tuesday. Preseason games are being arranged at the moment by Martin Harris. Details will follow but please put the below dates in your diary. The league season starts on the 10th May, with the first team at away at Great Brickhill and the seconds are at home to Horspath III. 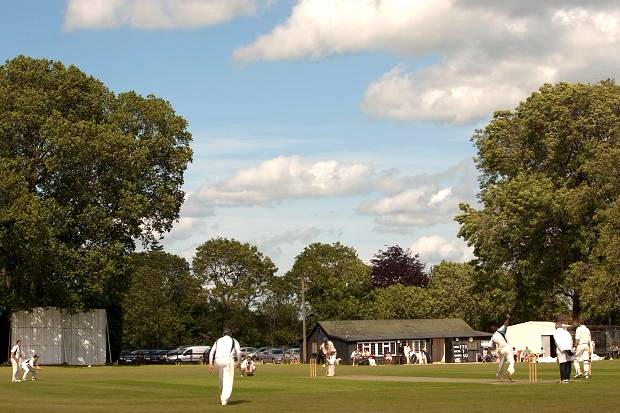 On the 11th May BRCC will play Stoke Green at home in the first round of the village knockout. Speaking directly to first team squad members (which is everyone in the club) we will meet one hour or more before every competitive league and cup game, apart from Dakes because he’s family and he might not want to be there an hour before. This will be considerably more flexible in the second team. Bledlow Ridge playing shirts should be worn by all playing members, although the captains will carry a couple of spares for last minute call ups, new members or people who haven’t had a chance to purchase one. These can be purchased from Hawkinsports in Bourne End, so please contact Rob if you require one. On behalf of the playing committee, I would like to take this opportunity to wish you an enjoyable 2014 on and off the field and to thank everyone in advance for their support and hard work. ....or not, but then you were never going to click a link that said "AGM as dull as ditch water" were you. The traditional warm up to Shakey's (I'm the webmaster and I'll bloody well decide if there's an e in it) quiz, was attended by a die hard crew (excluding the 1st team captain who was rewarding his myriad of staff (Jamie) for their dedication throughout the year), and included all the usual constitutional stuff, but was most noticeable for an acute onset of paranoia by the outgoing and simultaneously incoming Chair. Having given his usual fire and brimstone speech about the eternal damnation awaiting those who were more than 20 minutes late with their subs, he then went on to describe a dastardly plot he had uncovered by some Machiavellian Trotskyites, to take over the club from under our noses. Seemingly, said Bolshevik revolutionaries have hatched a long term strategy involving the production of children as long as 14 years ago, who were surreptitiously infiltrated into the club as sleepers, to be activated when we least expect it. He declared a state of Marshall law and proposed that the cricket committee (who knew we had a cricket committee?) vote itself draconian new powers at its next meeting. It was unanimously agreed by the floor that the time when we would least expect such a thing to happen was equally now and never and that the Chair needed to give up giving up drinking. With a resigned sigh, he moved onto the next item on the agenda, which was his annual rant regarding the death of Sunday cricket and the apparent indifference of the lazy $@8(£^%8 that called themselves cricketers to do anything about it. Just as he was about to hit fever pitch, the cricket committee (again?) announced that the currently ranked first equal world's grumpiest Scotsman had decided to split the Celtic alliance that had guided the 2nds to promotion and take over the leadership of a Sunday side. Furthermore, the self same cricket committee (who are these people? ), had tabled a number of items for their next meeting regarding player availability, fixture priority and integration (or otherwise) with existing Sunday commitments. Somewhat deflated, he then pulled his trump card out. Had we actually been promoted? Because it's a well established fact that the league are out to get us. The whole committee is populated by Machiavellian, Trotskyite, Bolshevik Bledlow Ridge haters and ...... at which point the cricket committee (you're making this up!!!) reported that the Secretary had received a letter from some very nice people at the League, confirming our promotion. The Chair at this point gave up, ordered a beer and went and bought everyone fish and chips. On the dull, but necessary side, the club is liquid due to a fabulous year behind the bar, and has a full complement of officers, with Dave Bird taking over the 2nd team vice captaincy from Doug McIndoe as he sets off on his Sunday adventure. The committee remains unchanged other than this, apart from the appointment of John Rolfe as chairman of the cricket committee ( Ahhhhhh). But you must not divulge this information to anyone, cos if Pam finds out, all hell will break loose!! It happened 40 summers ago, but they will never forget it, those Cornishmen who lived out a hitherto foolish fantasy. Troon were the moonwalkers of grassroots cricket, the first village team to win at Lord’s, and the captain of that 1972 side has retold the tale in their club handbook this year. Terry Carter not only led them out and lifted the trophy, he also won that inaugural National Village Knockout final with a six. He might have dined out on it ever since, but he prefers the collective memories — almost the entire 2,500 population turning up for the semi-final, the London-bound supporters’ train turned back by a derailment and the glorious homecoming to flags, bunting, lined streets and a party like there was no tomorrow. The anniversary is timely, for village life has undergone fundamental change and its cricket has not been immune. Transport and technology have eroded the tribalism and permanence of such communities. As pubs and post offices close, so do many cricket clubs, their spirit withered by flagging availability of players and helpers. Somehow, the cup that Troon won has survived the modern disdain for anything that excludes celebrities. Inevitably, its entry has declined — more than 800 villages in the 1970s, only 292 this year — but the final is still at Lord’s and, to thousands whose seasonal preparations involve nothing more strenuous than scraping last September’s mud from the boots, that remains the ultimately enchanting challenge. It may be fashionable to deride as bogus the picture postcard image of an English village, yet reassurance for romantics is easily found in this competition, now under the appropriate sponsorship of Yorkshire Tea. Bledlow Ridge nestles in the Chilterns, between Walter’s Ash and Beacon’s Bottom. It sounds bucolic and once was. Nowadays, it is a prosperous hamlet of fewer than 1,000 mostly professional people who can commute either to London or Birmingham in an hour. Stanley Holloway and David Nixon once lived there. Now, with the M40 and a fast rail link on its boundaries, this is the model of a contemporary village. “It’s not the place it used to be,” Sid Bird said, reminiscently. He has lived there all his 70 years, “old enough to remember the last horse and carts”. He first played for the club aged 9, even before the present ground was bequeathed by a dapper landowner named Reginald Johnstone, who ran the local Home Guard in a fashion familiar to millions of TV viewers. The village has much to thank Johnstone for. So do the few dozen people in cars and deckchairs on a breezy Sunday, with Plumpton and East Chiltington providing the opposition and a place in the last 16 at stake. The immaculate, tree-lined field has covers acquired from the nearby private ground of the late Sir Paul Getty and a single-storey pavilion extended through the years by club volunteers. Bird is club president. He also helps on the ground and, today, he is scoring at a table in front of the caravan that housed the overseas player before they gave up on the idea. The under-10s had played on Sunday morning and won. It was not going so well for the seniors. They had batted first in the four previous rounds and won as routinely as they were doing on Saturdays, as leaders of the Cherwell League’s third division, but now the visiting team from East Sussex were taking to some loose bowling. On the boundary, Ben Keeping, confined by injury to twelfth-man duties, fretted. Keeping talked of the “eclectic mix” in his team. Paul Brzezicki, the captain, is a carpenter and there is a builder, a draughtsman, an accountant, two IT experts and some students. There is also Geoff Tombs, who runs a cake decoration business and enjoys his reputation as the lothario bachelor of the side. None is on the receiving end of quite so much good-natured banter as Keeping. He is a City banker and has recently become a Lord. “I discovered that Bledlow village had a lordship lying vacant, so I bought it as a bit of fun,” he said. “Lord Bledlow” is about to move into the expansive house next door to the club and is thus being exhorted to loan out his lawn as a colts’ ground. A bevy of wives produced a spectacular tea — “special occasions only, these days,” Stevens said — and Bledlow Ridge then produced a spectacular collapse. At 43 for eight, pursuing 204, there was a resigned movement among the deckchairs. Start the car. Lord’s will have to wait another year. Or maybe until those under-10s grow up. 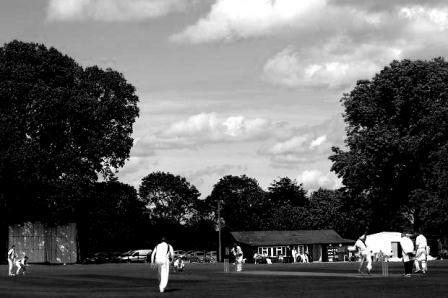 In its article in praise of village cricket extolling the remaining signs of a bucolic life The Times fails to undercover the murky waters and intensive rivalries that swirl not far below the calm surface at Bledlow Ridge. Few know for example the intense rivalry between the upcoming Lord Keeping of Bledlow and the Club President who as the Lord and Master of all he surveys is jealously guarding his status as old grandee and Master Banker. Yes President Bird runs the Bank of Bledlow with a unique approach to deposit-taking. “I don’t believe in all that stuff really” he replied when asked about Investment Banking, “I keep mine in a tin”. The locals believe the tin is kept under an oak tree somewhere in Frenches Wood an expanse of woodland managed by former Club Secretary Richard “The Saint” Sainter, though none can be sure exactly where . When it was discovered that Frenches Wood is in Chinnor and not Bledlow Ridge, The Saint was forced to give up the role of Secretary but he and The President came to an accommodation in which the Bird riches could be safeguarded under a large tree in return for Saint’s unlimited Passport Entry to the village and the continuing privilege of running social nights. This has generally worked well but there is the continuing threat from another of The Ridge’s dark souls, Arsonist Malcolm Ashby. The public get to see Guy Fawkes Night celebrations and Jubilee Beacons as happy celebrations but such events are merely cover for the ritual burning of former umpires and those who do not recycle their rubbish. There is suspicion that the new-age Lord of Bledlow has agreed to supply Arsonist Ashby from his recently cleared copse so that the sacrifice of officials and environmental heretics can continue. The Club President ranks as an Official too but Lord Keeping’s rotten plan was ruined when it was discovered the President does not burn. It is suspected however that the Chairman might ‘react’ differently to a lighted match, indeed the dark arsonist might never again need to build a beacon if he can sacrifice the Chairman; or if not the Chairman, then the Treasurer. The ”bevy of wives” reported by The Times, who prepared a “spectacular tea” appear unified on the surface but the recent discovery of some eggshell in the egg mayonnaise sandwiches is proof if proof were needed of the intense rivalry between competing tea ladies who will stop at nothing to curry favour with their diners. Curry itself has yet to be tested but it is only a matter of time… unless Arsonist Ashby gets there first of course. At Bledlow Ridge all this is known as Tea Wars. But this is nothing compared to Supporter Wars. You see, Tommy Beattie won the Supporter of the Year Award so many times that the Club was forced to withdraw it in fear of reprisals from swathes of jealous supporters. Tommy simply went down to Princes Risborough Rugby Club and won the Support of the Year Award there at the first attempt. Ashby prowls with a match. It is not surprising that The RidgeBears are so diverse. One clue is in the range of nicknames which indicates there is more to Bledlow Ridge CC than a quiet pastoral cricket team. These simple folk comprise those such as Diesel, Shakey (no E), Ferrett, Egg, Finger (don’t ask), Bails (imaginative or what? ), Buddha, Sahib and the Guv’nor. They all simmer at the thought of the young pretender named “Lord of Bledlow”. And then there is the Dog family, reputed to be the Bledlow Ridge Mafia: BenDog, MorfDog, TombsDog, RolfeDog and even BirdDog not to mention an Australian cousin WelshDog whose initiation involved a sinister ceremony where he had to sing Karaoke for hours in the direction of Frenches Wood. This Mafia group is believed to use ancient weapons of torture and, worst of all, irony. The “eclectic mix” of professions referred to by Lord Keeping in The Times has caused problems already. The Draughtsman is threatening legal action for not being described as an Architectural Technician. Furthermore the Lord omitted to mention the village’s dark medieval working practices. Notable in the VKO was the absence of a Senior Carpet Cleaner (or is it Ground Fabric Technician?) who despite running a company with at least one other employee, has nominated himself Employee of the Month for four months in a row. This hints at dark practices elsewhere too: no one has ever emerged from CrownField looking young…after all look at Baz or Morf, while a local producer of cake decorations has been known to employ hundreds of elderly women lined up in Dickensian workhouses night after night with nothing but catfood and birdseed to sustain them. So whether Bledlow Ridge’s cricketers are bucolic souls or contemporary professionals, scratch the surface and you find deep-rooted tribal differences sustained by Victorian practices and ancient rituals. All this, the writer was able to contemplate while batting against Plumpton and East Chiltington wondering why batsmen were running themselves out at the other end. And wondering when the Arsonist would strike again. ..... as Saint announces that there's no draft lager, only cans. Well to be fair, controversy is perhaps a bit strong. Brooksy was heard to say, "Oh really, no draft? Better have a can then", and that was pretty much it on the controversial stuff. The AGM on the 9th of December 2011, was fairly well attended (in a relative sort of way) and expertly chaired by the venerable and unfathomably reverend Mr Michael Stevens, whose Chairman's report was dominated by the message that we were all going to be interminably damned unless we started playing cricket on a Sunday. This was one of the many conclusions presented by the Chair from the cross party, cross bench,cross team, independent, judicial inquiry, otherwise known as the Keeping report. Contrary to the majority of attendees thoughts, this had nothing to do with the relative merits of Sam Rolfe, Phil Brooks, Dave Wood, Matt Donnelly and occasionally Dave "I think I may have just broken my [insert bone/joint of choice] so am off to hospital" Moander Maunder and Doug "I have just broken my [insert bone of choice] but will carry on and continue taking fractures for the team" McIndoe. It was in fact a report prepared by "Lord Keeping" to look at ways of attracting new players and keeping (you see what I did there) existing ones, with a view to the club's longer term survival. It was resolved that the committee, once elected, would examine the report in more detail with a view to implementing its recommendations in due course. The Chair went on to thank the attendees for .......... well ......... attending, Brezza for taking over the reins and turning the 1sts season around, and in particular John Rolfe for putting the needs of the 2nds ahead of the needs of his wife! The Chair then handed over to the Treasurer, the venerable and unfathomably prudent Mr Mike Stevens, whose report indicated that we were all going to be interminably damned if we didn't start paying our match fees. He then presented the club's accounts which were about to be passed on the nod when Dan Strange noticed an anomaly. The Treasurer acknowledged Mr Strange's comments, gave them due consideration and then responded by saying that any more smart arsed comments like that would result in us waiting until Mr Strange had left the premises and unanimously electing him to the post of Treasurer in absentia. He then thanked Saint for a marvelous effort running the bar, and in particular, John Rolfe for registering the majority of the population of South Bucks, thus further boosting bar profits. This led on to a discussion regarding junior cricket (given the parent's contribution to said bar profits), led by the venerable and unfathomably child friendly Mr M Stevens, during which the success of Friday junior cricket was acknowledged by all and a discussion, prompted by Mr D Strange regarding CRB checks ensued. The Chair gave considerable thought to Mr Strange's comments and then responded by saying that any more smart arsed comments like that would result in us waiting until Mr Strange had left the premises and unanimously electing him to the post of Child Protection Officer in absentia. Mr Stevens went on to thank Shak(e)y and his fellow junior coaches for their fantastic work during the season, and in particular John Rolfe for producing two sons who had played for the club thus proving that he did not spend every waking minute phoning Jolly to try and get him to bat at 13 for the 2s and that youth policies do actually work. We then headed to the Hustings for the exciting part of the evening. The Chair, Treasurer, Bar Manager and Social Secretary were all prepared to continue and were unanimously re-elected unopposed, however after the universally acknowledged prowess of the Keeping report, Lord Keeping will be busy solving the world's financial crisis next year, so stood down as Secretary to be replaced by Ian Murdoch. The meeting urged Brezza to continue with the job of Club Cricket Captain and 1st team Captain, and his choice of vice captain, Jamie Stevens, was unanimously approved. There then ensued a heated debate about the second team captaincy, with Taggart making a cogent and well argued case for the job which ran along the lines of "If absolutely no-one else will do it, I will" which immediately got him the job. At this point, Mr D Strange pointed out that we needed to give the league a name for 2nd team vice captain, and as long as he didn't have to do anything, he was happy for this name to be his. The Chair gave this proposal balanced consideration and then responded by saying that any more smart arsed comments like that would result in us waiting until Mr Strange had left the premises and unanimously electing him to the post of 2nd team skipper in absentia. The argument was swung however when Shak(e)y announced in an accent that made Mel Gibson sound like Sean Connery's brother, "U'll no play fur wan Scotsman, but U'll play fur too" and as Smartphones abounded and Google translator went into meltdown, Doug McIndoe was elected in the confusion, thus ensuring at least one top tea next season. The club's new captain then delivered his address, an impassioned and committed piece which summed up a seemingly new era of positivity in the club, and if the players respond with half of Brezza and Jamie's commitment, then 2012 looks like being a good season. After a couple of items of other business, including the announcement of a fabulous new website, the venerable and unfathomably not staying for the quiz Mr Stevens thanked everyone for their contribution, and in particular, John Rolfe for ............. something. He then called the meeting to a close and we all hung around until Dan Strange had left and unanimously elected him to all committee posts in absentia. The league have confirmed that Bledlow Ridge 2s will play in Cherwell League 7 next season, despite finishing one place above the relegation zone in 2011. A new club has entered the league, and as is normal, will be slotted into division 5, thus forcing 2 teams in 5,6,7 etc. to be relegated. This is a repeat of what happened to the 2s last year and the club considered an appeal, however the likely answer was always going to be "Stop finishing 9th and it won't affect you", so it's off to Didcot, Aston Rowant and of course Bledlow next season.